@ Don... 10 rows behind 1st base. This stadium is amazing btw. It’s Miami 100%. Had a Cuban coffee that was outrageous. Had a Lomito for dinner at an Argentinian place in Little Havana. Truly incredible. Sorry you have to witness this shtein live Rome. The Cuban Coffee sounds nice. Lomito Completo! Had one in Miami like 15 years ago after flying all night from Hawaii. Still brings tears to my eyes. 2 f'ing hits tonight and one is by Kingery. I wanted to add there isn’t a single chain operator in there. It’s all local Miami people. Thought that was pretty cool. The juggernaut is leaking oil. Jean Segura was inspired by Tiger Woods and golfed one out of the park in the 14th. 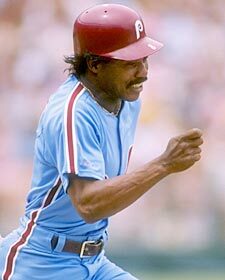 Then the Phils survived Alvarez. Yes it's the Marlins but damn the bullpen was in another solar system yesterday. Sir Anthony, Hector and Arano were throwing nasty stuff.